Teen Dating Violence Awareness Month aims to prevent teen dating violence and abuse and to promote healthy relationship behaviors. Today, 1 in 3 high school students experiences some form of dating violence in their relationships. For Native American teens, the rate is even higher. 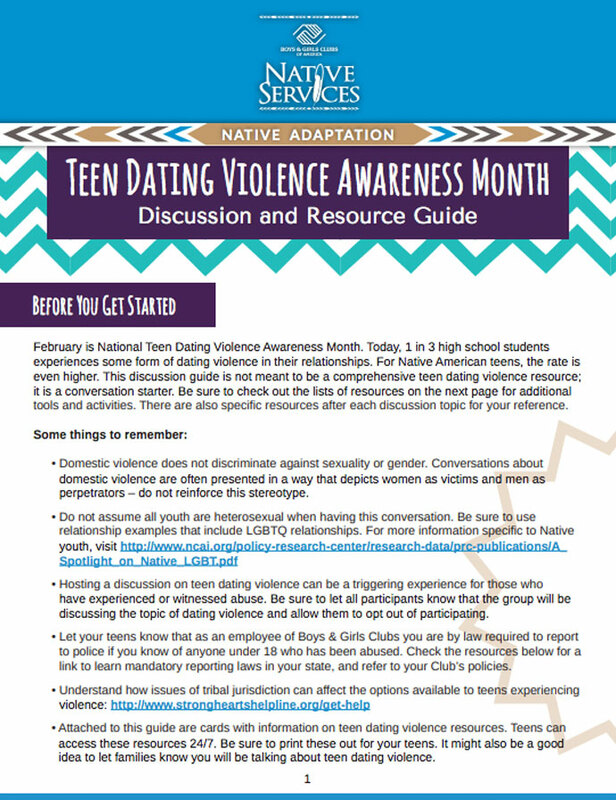 The Native Adaption of BGCA’s Teen Dating Violence Awareness Month Discussion and Resource Guide is helpful in discussing teen dating violence with youth. In one study by the Center for Disease Control, the rate of teen dating violence among high school students in Alaska’s Native communities is 13.3 percent, nearly 4 percent higher than the national average of 9.8 percent. In the child protection system, American Indian children are more likely than other children to be identified as victims of abuse – 12.4 of 1,000 children experience abuse. This means that American Indian families are twice as likely to have allegations of abuse investigated; twice as likely to have allegations of abuse substantiated; and four times as likely to have their children placed in out-of-home care. Identification of domestic abuse by teens can be more challenging because of minimization. Many American Indian youth believe that abuse only means that they were hit. They often don’t understand that abuse includes insults, isolation, humiliation, coercive control and threats of suicide upon breakup. This discussion guide is not meant to be a comprehensive teen dating violence resource; it is a conversation starter filled with support and resources for Native teens who may be experiencing teen dating violence or abuse.